The Husky 19-Piece Screwdriver Set is the ultimate set for the true weekend warrior, very advanced Do-It-Yourselfer or professional tradesman of any kind including mechanics, electricians, plumbers, carpenters, handyman and more. New contoured handles provide superior torque generating power and enhanced comfort. Handles are also easily cleaned and resistant to dirt, grime, oils and solvents. The alloy steel blades are heat treated for superior strength and are nickel plated for resistance to corrosion. With a Lifetime warranty, you can buy this set with confidence knowing you will always have the right tool for the job. The DEWALT DWHT62058 8 Piece MAXFIT Screwdriver Set is made with a Bi-Material Ergonomic Quad-Lobe Handle Design for comfort and maximum tip torque. The Max Fit Tip design allows for maximum fit in fasteners and eliminates screw stripping. The CNC Machined Tips ensure consistency for fitment and extended life. The tool-grade S2 steel bar and tips allow for high strength and durability. The Magnetic Screw Lock System prevents fastener and screw wobble. The yellow torsion zone flexes reduces cam-out and the hex bar allows additional leverage when used with a wrench. The 1/4 in. hex torque drive has been calibrated for +/- 4% accuracy. Its positive bit locking to eliminate slippage or dropping in tight spaces. Perfect for technicians working on aluminum to copper connectors requiring limited torque. 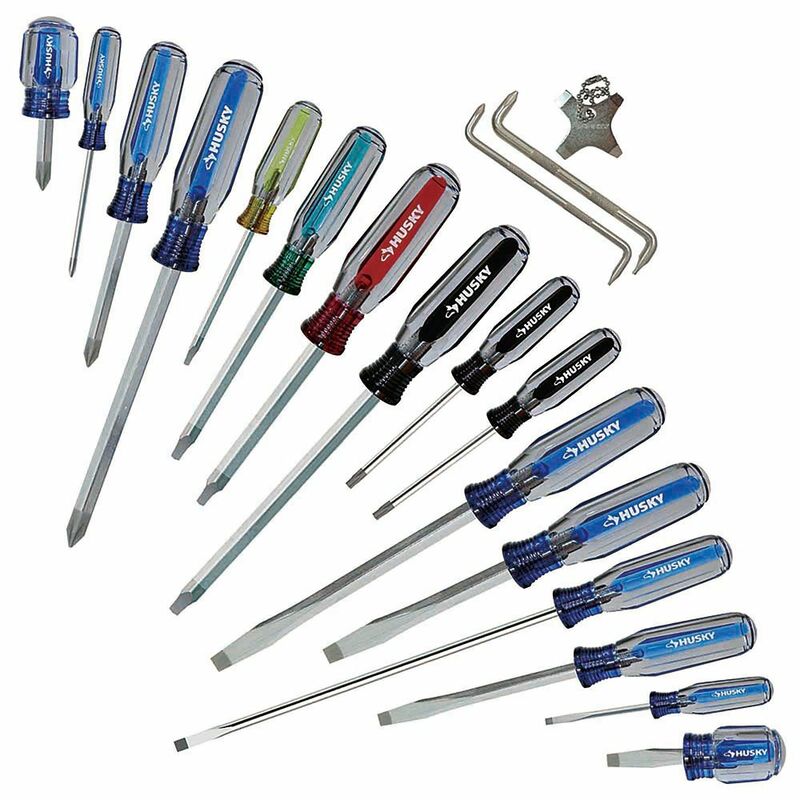 Acetate Handled Screwdriver Set (19-Piece) The Husky 19-Piece Screwdriver Set is the ultimate set for the true weekend warrior, very advanced Do-It-Yourselfer or professional tradesman of any kind including mechanics, electricians, plumbers, carpenters, handyman and more. New contoured handles provide superior torque generating power and enhanced comfort. Handles are also easily cleaned and resistant to dirt, grime, oils and solvents. The alloy steel blades are heat treated for superior strength and are nickel plated for resistance to corrosion. With a Lifetime warranty, you can buy this set with confidence knowing you will always have the right tool for the job.